A quick explosion of color followed by a thick blanket of snow. That’s how fall goes in Tahoe. When we get the winters we hope for, that is. The first part of the equation is already under way. Here are my top five things to do in Tahoe during fall. Other than snow dancing, of course. Since we only get one chance at this each year, it’s first on our list. Tahoe is all about breathtaking scenery, and fall is no exception. Arguably the most beautiful time of year, here are some of the best places to take it all in. Hike, get great photos or just sit and stare for awhile. -Blackwood Canyon, south of Tahoe City on Hwy 89. – Paige Meadows, near Tahoe City. – Anywhere near Fallen Leaf Lake/Tallac/Angora Lake. – Brockway pass along Hwy 267. As the colors peak, you’ll see several painters stationed here, capturing the image on their canvases. – Hope Valley, near Carson Pass. – June Lake, near Mammoth Lakes. 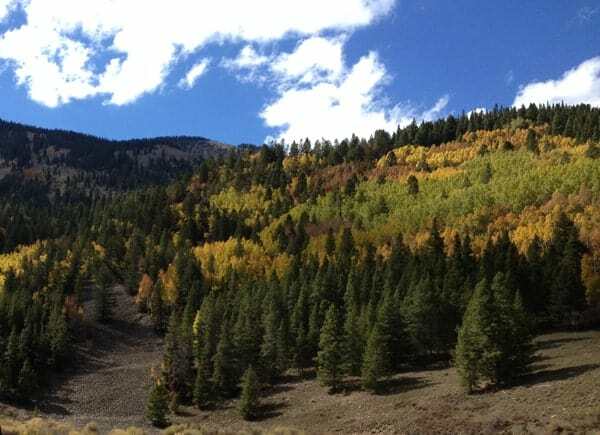 – Aspen groves on the downhill (Hwy 395) from Bridgeport to Mono Lake. Get great views from the highway, or take a short adventure to Travertine Hot Springs. Not a photography aficionado, but still want to capture the experience with some great images? A professional photographer recently told me that the camera is the least important part of the equation. You don’t need a Nikon D1 to shoot fall colors like a pro. I get great shots with my GoPro HERO3 Black Edition. 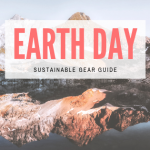 Use GoPro’s Tripod Mount with the compact Joby Gorillapod Camera Tripod and your crystal clear images will have your friends convinced you are a pro. 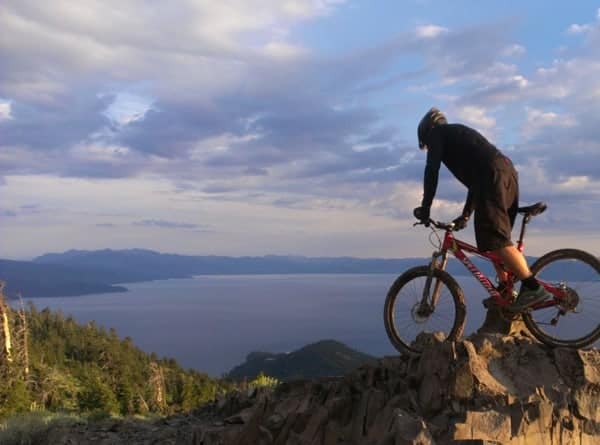 Summer is great for mountain biking in Tahoe, but fall is better. Trails are less crowded. The scenery becomes even more beautiful. And the occasional rain and cooler temperatures keep the dust down. Biking is my favorite fall activity, by far. So much so that it even saddens me when the snow begins to cover the trails. But only until it’s deep enough to shred. – Hole in the Ground, a long loop near Boreal ski area – painful and serene, all at once. –Flume Trail/Rim Trail Loop in reverse, from Spooner to Marlette to the flume – this is the best way to do it. You’ll probably need a cold beer, followed immediately by your bed. -Rim Trail, Brockway Summit to Mt. Baldy – a demanding climb, but very rewarding. Going the other way from Brockway to Watson Lake is also a fantastic ride, and very hard work. -The Bench Trail – conquer this one from either side, Spooner or Kingsbury, or get them both in one ride if you’re feeling savage. Don’t forget your CamelBak bike backpack with lots of water, and an extra layer. You’ll be hot when you’re pedaling, but you’ll want to manage that sweat so it doesn’t turn you into a cyclisticle through the exposed zones and downhills. A spare tube, bike pump and tire levers are also more important during fall, when you are less likely to cross paths with good Samaritans out on the trail. I learned this isn’t just a warm-weather activity two winters ago when mother nature forgot to drop any snow on Tahoe until March. Living across the street from the Incline Village disc golf course, throwing disc quickly became my go-to when there was too much snow to bike, but not enough to snowboard. It’s a great course for beginners, too, as it is mostly flat. And while the plethora of trees can frustrate newbies at times, they provide great cover from the wind on most of the course. Wear a pair of light gloves and a hoody, and you’ll find disc golf is just aerobic enough to make being outdoors on a chilly fall afternoon almost as comfortable as summer. 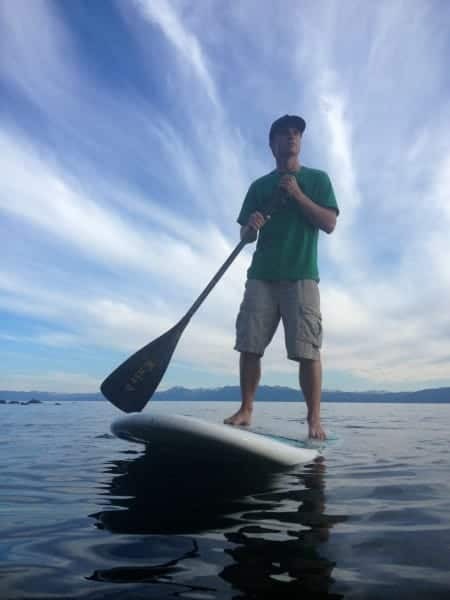 For a greater challenge, head to Lake of the Sky in Tahoe Vista, Truckee River Regional Park in Truckee, or Bijou Community Park in South Lake. All three have great courses. Want some tips for playing disc golf at elevation? Read this article on high altitude disc golf for some tricks to improve your game where the air is thinner. 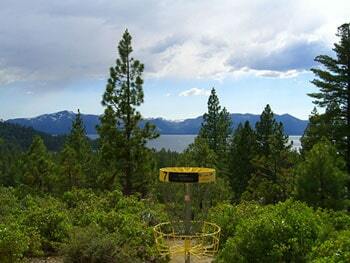 – DL Bliss State Park, just north of Emerald Bay, has great bouldering. 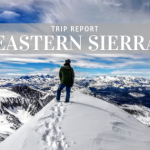 – Donner Pass has many sport, trad climbing and hike around to top-rope options. – Lover’s Leap, near Strawberry, is a haven for moderate-level granite. Sheer cliffs and multi-pitches abound for sport and trad climbing. Spend days here without repeating routes. 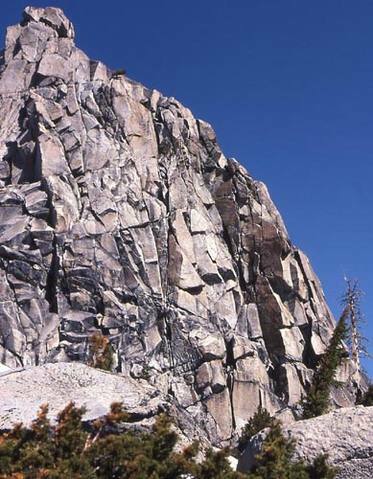 – Bishop & The Owens River Gorge have world-renowned bouldering and sport climbing. – The Buttermilks feature many V7 problems and the weather is a bit warmer down in the desert, if you need to escape the mountains when temps get low. – When the weather calls for indoor climbing, hit High Altitude Fitness in Incline Village or the bouldering gym at Truckee Sports Exchange. 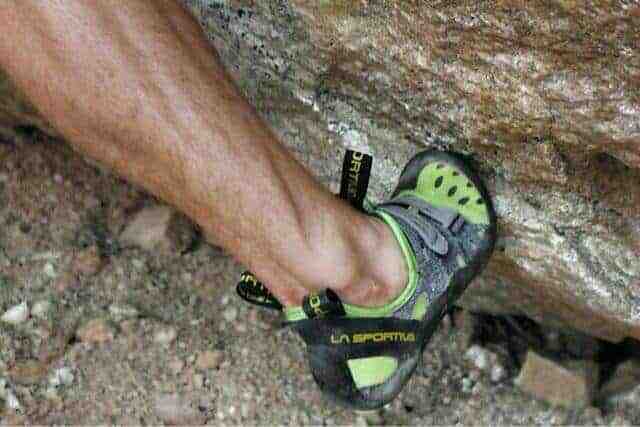 Need a belay? How about harnesses, shoes or ropes? 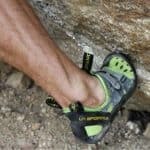 We carry rock climbing gear from Black Diamond, shoes from La Sportiva, accessories for sport, trad and bouldering, and more! And don’t go without your Tahoe climbing guidebook! 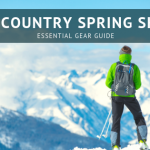 Pick up a copy of the Locals Guide To Rock Climbs Of North Tahoe or the High Sierra Climbing Guide and be your own Tahoe rock climbing tour guide. Yeah, I said it. Surfing. Fall brings wind and wind brings waves to Lake Tahoe. There is actually a small surfing culture here, which most people are unaware of. You can’t do it anytime you want, but I’ve seen several days good enough for dudes to paddle out in recent weeks. Usually, you’ll need a longboard. I just have a shortboard and I rarely see conditions suitable for its length. I don’t recommend learning to surf here, though. The water is frigid and the wind would likely make the whole experience quite unpleasant for a newbie. But experienced surfers with proper wetsuits will likely get a kick out of it, and the time you went surfing in Nevada will always make a great conversation. Sand Harbor, on Nevada’s east shore of the lake, is kind of the go-to spot. But don’t worry, it won’t be crowded.